Hi, I’m Dr Jacinta Delhaize from the University of Zagreb in Croatia. This article is Part Two of the ‘Naked in Croatia’ series, in which I recount the adventures of The Naked Scientists’ Dr Chris Smith during his visit to the country of Croatia. If you’d like more context, you can check out Part One of the series where I explain why Chris joined us in the Croatian city of Zagreb for a science engagement extravaganza. In this second instalment, you'll find out what happened when Chris held a science communication master class in Zagreb and revealed some of his secrets of naked science. 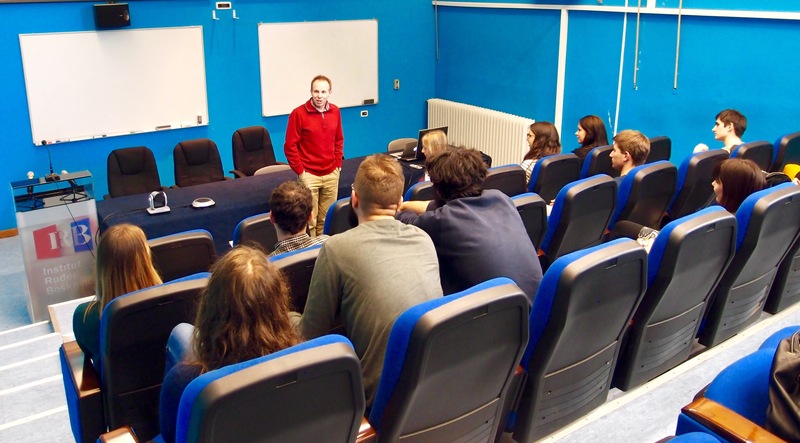 The Naked Science Master Class was held at the Ruđer Bošković Intitute - a leading Croatian research institute, and was attended by twelve selected junior scientists from the University of Zagreb. These attendees were undergraduate, Masters and PhD students from a broad range of scientific fields including biology, physics, computer science, engineering, marine science and mathematics. The limited size of the class meant that each attendee could receive personalised advice from one of the world's best science communicators on how to give engaging, accessible science presentations. 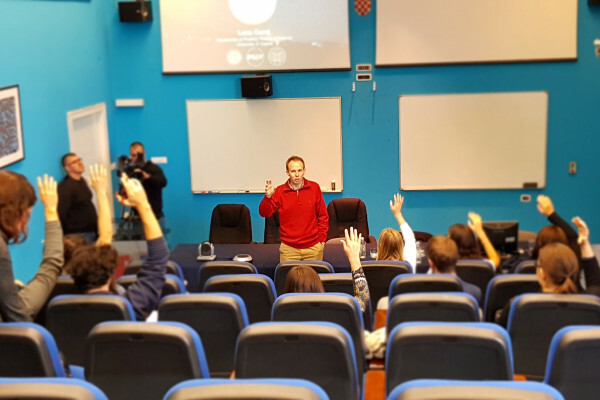 Above: Chris holds a science communication master class at the Ruđer Bošković Intitute in Zagreb, Croatia. The junior scientists selected to attend were Matija Piškorec, Ivan Sudić, Lana Ceraj, Maja Maslać Mikulec, Karolina Matejak, Tena Dubček, Ivan Miosić, Dea Brunović, Daniil Zhivotkov, Boris Okorn, Ana Najev and Maria Brbić. The master class began with a discussion on why good science communication skills are super essential for scientists and for the world. Chris explained that it’s extremely important for any scientist to be able to explain their work clearly to both expert and non-expert audiences. After all, what’s the point of making a discovery if you can’t tell someone about it? Scientists must regularly share their work with their colleagues through scientific publications, conference presentations and seminars. This allows scientists stay up-to-date with the latest developments in their field, generates discussions of important topics and fosters collaborations between scientists. However, many of the students in the master class said they had recently attended conferences where very few of the presentations made much sense to them. This is often not because of any lack of skill on the junior scientist’s behalf, but more likely because many presentations are not delivered in a way that is accessible to those outside the presenter's sub-field. Presenters sometimes assume too much knowledge or get bogged down in unnecessary detail. It’s also extremely important for scientists to be able to share their work with other non-expert audiences such as the broader scientific community, funding bodies, the media, the general public and, of course, their families and friends. This is how research in the lab or office can be disseminated through society and start to have an impact on our lives. Although it’s a very important skill, effective science communication is not always easy and isn’t something that junior researchers are necessarily taught. It actually requires you to understand your work very well because you can’t hide behind equations and scientific jargon. Instead, you have to distil your topic down to its essential components and explain it in a way that is clear, relevant and captures the interest of the intended audience. To do this, you must understand exactly why you’re doing what you’re doing, why it would be interesting and important to others, and what the main message is that you are trying to get across. So Chris suggests that it's a good idea for every scientist to have a well thought out ‘elevator pitch’. If you were in an elevator with someone who asked you what you work on, would you be able to explain it by the time the elevator reached the top floor? If you can do this, then you’re well on your way to being an effective science communicator! To gain some practical experience in science communication, each master class attendee gave a short, five-minute presentation about their own research, or a science topic of their choice. The challenge was to make a presentation that would be clear, engaging and easily understood by the other students in the audience who were not necessarily experts in the same area. After each talk, the presenter received immediate, detailed feedback from Chris and the other students. We heard some really excellent talks and Chris was very impressed with the quality. "Actually, I can honestly say that these were some of the best student presentations I have ever seen in any of the countries where I've run workshops and listened to talks - and there are quite a few of them! Simply brilliant! I went up to about 5 of the speakers afterwards and immediately invited them to write for the Naked Scientists!" There were a whole variety of interesting talk topics such as the role of lichens in controlling air pollution, algorithms on graphs, artificial intelligence, colliding neutron stars and sea level changes in the Adriatic Sea. Most students chose to use power point slides, but a couple of brave participants challenged themselves to speak with no visual aids! Above: PhD student Maja Maslać Mikulec delivers an engaging presentation on the role of lichen in the fight against air pollution during the Naked Science Master Class. Know what your main message is. If you don’t know, the audience won’t know either! Be sure to tailor your presentation specifically for the intended audience – every time! Use the appropriate language. Don’t use unnecessary scientific jargon or unnecessary equations. The ‘why’ is absolutely essential. Make your talk relevant to your audience by explaining why it is interesting/important to them. Always, always keep to time! Don’t speak too fast, or cram in too much information. Sacrifice some of the less important detail for the sake of clarity. Try putting them in 'extra slides' for discussion during question time instead. The audience’s attention span is probably shorter than you realise! Structure your talk strategically so that the answers to the most important questions (how/what/where/why) are presented and repeated at key moments when their attention peaks (such as the beginning and the end). Stay in control of where the audience focuses their attention. For example, by making bullet points and images appear one-by-one on slides. Don’t clutter your slides. Look at your audience. This makes it seem more like you’re talking to them instead of at them. It will also help you to read their body language and figure out whether or not they are engaged in what you’re saying. End on a high! Rather than fading out, make sure your final sentence packs a punch. Perhaps some of these tips will help you too! Above: University of Zagreb PhD student Lana Ceraj puts Chris' advice to the test during her presentation at the Naked Science Master Class. The students said they really enjoyed the master class format and especially the opportunity to receive personalised feedback from one of the world’s leading science communicators. Many said they came away from the master class feeling enthusiastic, encouraged and more confident in presenting their science. After mastering their science communication skills in Chris’ class, several of the attending students even became writers for The Naked Scientists website! Check out Gold digging astrophysicists by Lana Ceraj, Hunting down air pollution: Meet the lichens by Maja Maslać Mikulec and Graph Theory by Ivan Miosić. In the next instalment of ‘Naked in Croatia’, Chris meets the next generation of future scientists and engineers in Croatia and learns a thing or two about science with slinkies! Next Could global warming be in reverse by 2050?